Aadnyaapatra, by Ramchandra Pant Amatya, chief minister of Rani Tarabai. The English word 'fort' is derived from the Latin word 'fortis' meaning strong. 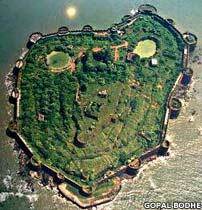 Forts were a primary defence mechanism in Maharashtra against enemy invasions, and had been so since ancient times. They are known in the local language as 'killa' (or 'qila' in Urdu). They were naturally and artificially protected human settlements, guarded by elements such as hills, forests, the desert, the sea, and man-made stone structures that formed a kind of armour around them. One of the early reference to forts in the subcontinent occurs in the ancient political treatise, 'Arthashastra' by Kautilya, whereby Kautilya classifies the forts as Jal durg (water forts), Giri durg (mountain forts), Vana durg (forest forts), Dhanu durg (arid/desert forts located in conditions which are devoid of a ready water supply), Mahi durg (brick forts), and Nar durg (human forts), not to mention the ancient cities in kingdoms such as Mathura, Magadha, and so on which were also mentioned as being fortified settlements. The social treatise, 'Manusmriti' by Manu, also describes the advantages and disadvantages of different classifications of fort. 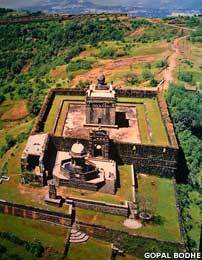 Due to its peculiar topography, Maharashtra has always revelled in different forms of fort constructions. Its structures and architectural designs have differed depending upon their region and location, whether these are on the plains, coastal areas, hilly terrain or in the dense forests. The forts in Maharashtra were constructed from the point at which some of the early ruling dynasties (and their vassals) held power, such as the Satvahanas, the Rashtrakutas, the Kadambas, the Chalukyas, the Yadavas, the Afghans, the Bahmanis, the Gonds in Berar, the sultanates of Ahmednagar, Bijapur and Berar, the Siddis, the Europeans (British, Portuguese), and last but not the least the Marathas. 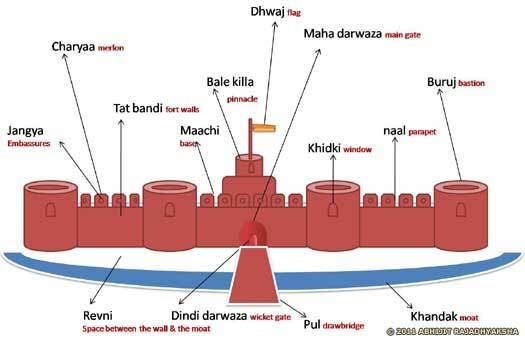 The Marathas gave tremendous importance to forts as they were their strongest defence against marauding invaders. 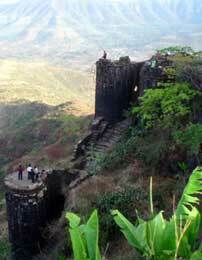 Due to the inherent hilly terrain of the Sahyadri range, most of their forts belonged to the 'hill' category. These forts protected the army and the wealth of the kings and housed virtually an entire village inside the fort. These forts were constructed on the high hills and made from stone cut from those very mountains. The high altitudes made these forts daunting for the enemy. In the vernacular Marathi language they were called 'Giri Durg' ('giri' means the mountain and 'durg' is the term for a fort), such as those examples at Raigad, Rajgad, Purandar, Sinhagad, Pratapgad, Shivneri, Rajmachi, and so on. These forts were created on the plains. In Marathi they were called 'Bhuikot' (Durg), and examples include Chakan fort, Bahadurgad, Solapur fort, Ahmednagar fort, and so on. These forts were created in the middle of the sea and protected by its vicious waves. In Marathi they were called 'Jal Durg', and examples include Janjeera, Sindhudurg, and Padmadurg. These forts were created amidst dense jungle, protected by the heavy tree cover, along with reptiles and wild animals. They were the 'Vana Durg', and Javali is one such example. These were formations created as a direct result of human warfare, and encampments often resembled forts. These were the 'Nar Durg'. Barring the last of these, which is a type of field fortification, the rest are all of a permanent nature. Forts in Maharashtra were often a combination of land and sea forts, such as Vijaydurg, or mostly hill and forest/land forts, such as Daulatabad, etc. The forts in Maharashtra were not as picturesque or aesthetic as their northern counterparts but were the most practical option available under the circumstances. The hill forts are most common in Maharashtra and scattered all around the Sahyadri mountains. They are located at short distances from each other and were accessed by crossing a couple of mountains. 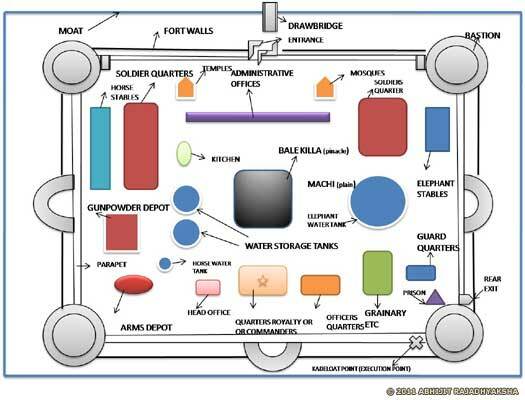 If a fort was captured by the enemy, this allowed the king and his officials to escape and easily reach the next fort. Hill forts were constructed from stones carved out of the very mountains, and were attached (depending upon the design) with the help of lime, rubble, gravel, stones, bricks (used mainly in land forts or smaller forts), molten metal and sand. Lime or mortar was ground on the fort itself (in what were called the 'Chunyaachya ghaani', 'chuna' being the term for lime), with the help of a roller passing though a circular channel. At several places the stones appear to be jointed by male and female connectors devoid of any use of mortar. Together they produce a construction that has lasted for centuries. 'Ghera' or the outermost boundary that encompassed not only the main fort but the many villages in its vicinity. 'Chowkis' or outposts were present near to forts to warn people within of any impending danger, keep a check on travellers, etc. Besides these there were 'mets' (smaller outposts) midway between the outposts and the fort, manned by locals and tribal people such as the Kolis, Ramoshis, and Maangs who were familiar with the surroundings and could even maintain a vigil at night. 'Kada' or the vertical portion of the fort and the most difficult spot to scale. 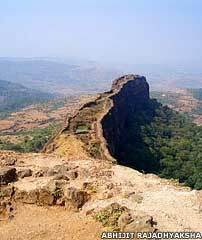 History mentions Tanaji Malusare, a commandant of Shivaji's forces who climbed the hill fort at Sinhagad from the 'Dongiri kada' because the other entrances were heavily guarded. 'Tat Bandi' or the high stone walls of the fort. They comprise the rampart with a running parapet, strengthened by the fort's walls with the 'charyaa' (merlons) and 'jangyaa' (embrasures) punctuated within them. The semi-circular merlons (a crenel between two merlons) provided cover for the guards and the embrasures that pierced the merlons supplied a view of the enemy below. There were even machicolations made and used for pouring hot oil over attackers or throwing stones at them from within the apertures. In cases where the walls were made of wood (as in European or American forts) these were termed 'medhekots'. Around the fort's walls, any weeds or plants were removed or burnt off so that enemy soldiers could not use them to climb the fort. Away from the walls, thick vegetation was encouraged so that a contingent of soldiers could be hidden away there to launch the first attack on any approaching enemy troops. 'Buruj' or bastions were built adjoining the fort's walls and also served to strengthen them. They were semi-circular turret-like extensions of the fort's walls which protruded on the outside. 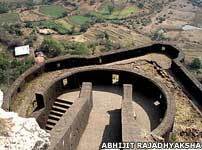 They also served as watch towers or bases for firing cannon, such as at Naldurg which has around 113 bastions. 'Mahadarwaza' was the main entrance (gate) of the fort, built large enough for an elephant to pass through. It generally had huge wooden (and metal) gates with rows and columns of long iron spikes affixed in order to prevent a enemy elephant or a wooden rammer from forcing open the gates. There were often more than two to three entrances one after the other at short distances (such as Pune darwaza at Sinhagad). Thousands of stone steps took one onto the mahadarwaza, such as at Raigad which was built 869 metres (2,851 feet) above sea level and has around 1,500 stone steps leading to the fort. Some 'Pedhis' or smaller forts had these nagarkhanas (drum houses also used as administrative offices and watch posts. If the attention of people below the fort was sought, then these nagars/drums were often sounded). They were built right over the mahadarwaza, as seen in the Shanivar wada, the peshwa's citadel in Pune. The walls surrounding the gates usually had mythological figurines of Gandabherund (the two headed eagle), Sharabha (half bird, half beast) or those of Hatti (elephant), Vyaal (tigers), or Sarp (serpents) carved on them. 'Dindi darwaza' or the wicket gate was small enough to let one man pass through and was built within the main gate. It could be opened and shut to let through small amounts of human traffic without opening the main gate. 'Bhuyaar' or secret tunnels provided a escape route for the nobles and their families in case the fort fell to the enemy. 'Gomukhi dwar rachana' (cow mouth gate formation) was a special formation of bastions including the ones flanking the main entrance gates. The bastions often numbered more than one and were built in the form of a cow's mouth, hence the name. The pathway was curved to prevent a direct frontal attack. The idea was that if the enemy attacked the main gate, then the gate could be defended from the front as well as the rear as a view of the main entrance was also made possible from the adjoining bastion. A fine example of the Gomukhi dwar rachana is at the fort of Raigad. 'Maachi' was the vast expanse of open ground which could be found after entry from the gate had been achieved. There used to be residential quarters and administrative offices built on these maachis. 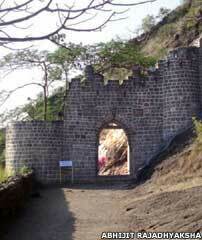 The periphery of this maachi was always fortified by high walls, such as Sanjeevani maachi on the fort at Raigad. 'Raj sadar' or the official quarters of the fort's commander (or the king) was also the place for discussing important official matters. Naturally, the tallest building in the fort was the 'Raj mandir', which belonged to the king and served as his residential quarters. Besides the Raj sadar and Raj mandir there used to be the 'khalbatkhaanaa' (the place for secret or strategic discussions), the 'bandigruha' (prisons), 'kadeloat' (the edges of the fort from where traitors and convicts were thrown to their death), temples, mosques, churches, samadhis, centotaphs, tombs, veergals (hero stones in memory of slain warriors), smaller residential quarters, clerical and administrative offices, toilets, etc. 'Ambaarkhaana' was the storehouse for consumables, the granary, such as the ambarkhana at Panhala fort which has three store houses named Ganga, Jamuna and Saraswati. Ganga is the largest one at 10.7 metres (35 feet) high and covering 947.6 square metres (10,200 square feet) with a capacity to store 50,000 maunds of grain (one maund = 40kgs). 'Toffkhaanaa' was the place in which to store gunpowder. It was a water-tight place to prevent moisture from making the gunpowder damp and rendering it ineffective. 'Ghodyaachya paagaa/ashwa shaalaa' were the horse stables in the fort (the same name was used for elephant stables; 'Hattishaala'). 'Paanyaachya taakyaa' were the water reservoirs which provided the water supply for the fort's occupants, such as the Ganga Jamuna water cisterns at Shivneri fort. 'Baalekilla' was the pinnacle point (the place at the highest altitude) in the fort. It was fortified so as to be a fort within a fort. In case the enemy did manage to enter the fort, the Baalekilla became the last point of defence. 'Khandak' or moats were used in land forts. These were deep, wide trenches dug around the periphery of the fort, and were filled either with water, spikes or thorny shrubs (or even crocodiles and poisonous reptiles) which could provide a defence for the fort from an oblivious enemy. 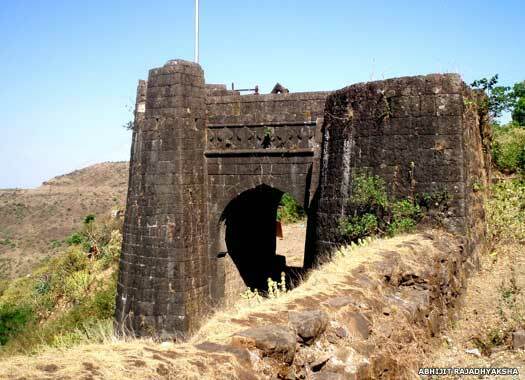 Access to the fort was made possible by a drawbridge that over crossed this trench, and Ahmednagar fort has a moat that is 24 metres (80 feet) wide and six metres (20 feet) deep. Chhatrapati Shivaji Maharaj, the Maratha king, clearly understood the importance of forts. He laid more emphasis on forts than land below them and ensured that his forts were always in the possession of the king. Shivaji ensured that each fort had between two to three top-ranking officers (besides the killedar or fort keeper), all of whom were of different castes: the Maratha 'Sarnobat' (for guarding the fort), the Brahmin 'Sabnis' (for general administration), and the Kayastha 'Karkhanis' (for maintaining the accounts and the treasury). These officers were to be of equal rank, just in case one of them was corrupt and conspired to hand over the fort to the enemy. Moreover, officers always competed with each other to provide a better administration within the king's jurisdiction, thereby improving the overall administration in the fort. The posts were never hereditary, so one had to rise through the hierarchy to gain one of them. No officers who were related to one another were given command of forts in that were in close proximity to one another. An adequate number of craftsmen including masons, carpenters, cobblers, blacksmiths, and tailors were also kept in the fort in addition to soldiers and other officials. There were also priests present, in the shape of the 'vaidya' (practitioners of ayurveda, the Indian science of medicine) and others in the fort. Access to the fort was kept as difficult as possible by planting trees and shrubs, which even provided cover for guards or army contingents placed below the fort. If a hill fort had another hill in very close proximity, then another fort would also be raised there and both would serve in conjunction with one another, such as the twin forts of Purandar gad and Vajragad, or Lohagad and Visapur gad. Damaged bastions or walls were repaired without delay. The main gates of the fort were always opened and closed at fixed times and exceptions were made for no one except perhaps the king. A strict vigil was always maintained in and around the fort. Discipline was always paramount and there was no scope for any relaxation of the rules. Shivaji spent a considerable part of his revenue on the upkeep of his forts. In his own words, 'the forts ought to be so impregnable that even if Mughal Emperor Aurangzeb fights for a year to conquer one fort, then to capture the total three hundred and sixty forts in Maharashtra, it should take him three hundred and sixty years (which was humanly impossible)'.